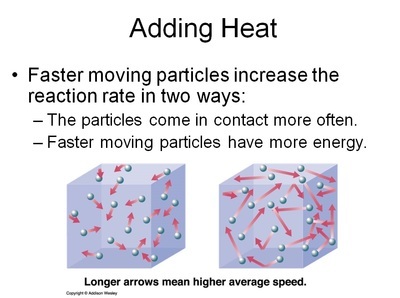 Heat energy - When molecules have more heat, they collide more often and with more energy. 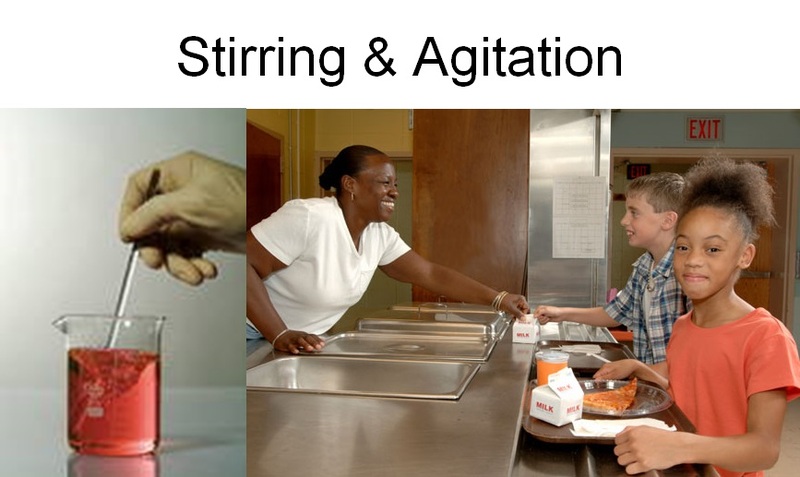 Stirring & agitation - when you stir/agitate, you whisk away old reactions so that new reactions can take place. 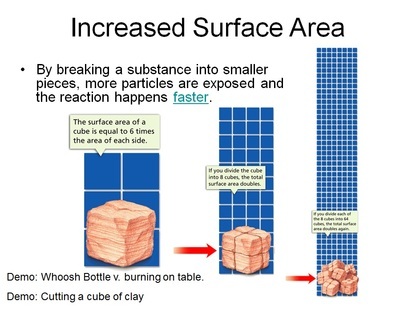 Increased surface area (cut it up or vaporize it) - reactions only happen on the outside of the substance. By cutting it up, you increase the amount of surfaces for new reactions to take place. Concentration levels vs. diluted - Concentrated means you have a higher ratio of active ingredient/substance v. inactive ingredients. 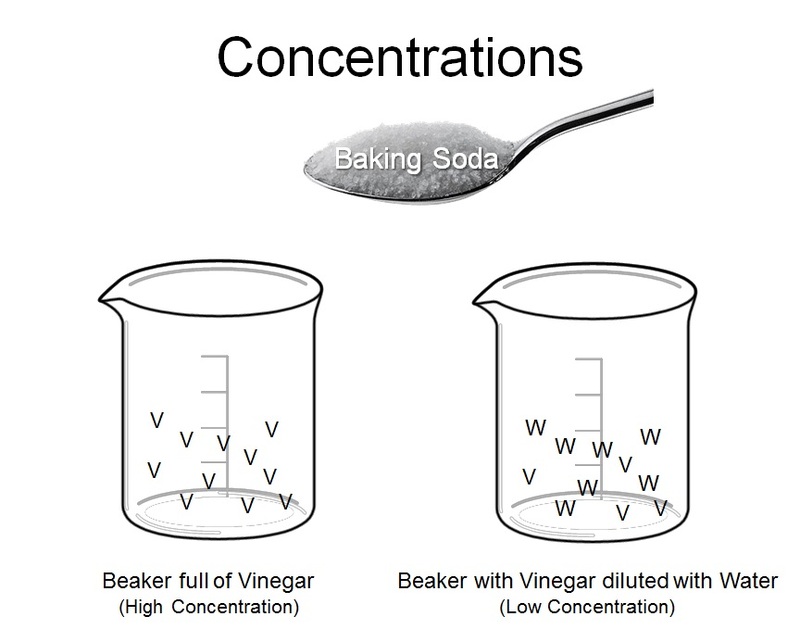 For instance, If I have pure vinegar I get more reactivity with Baking Soda than if I diluted it with water. Catalysts. 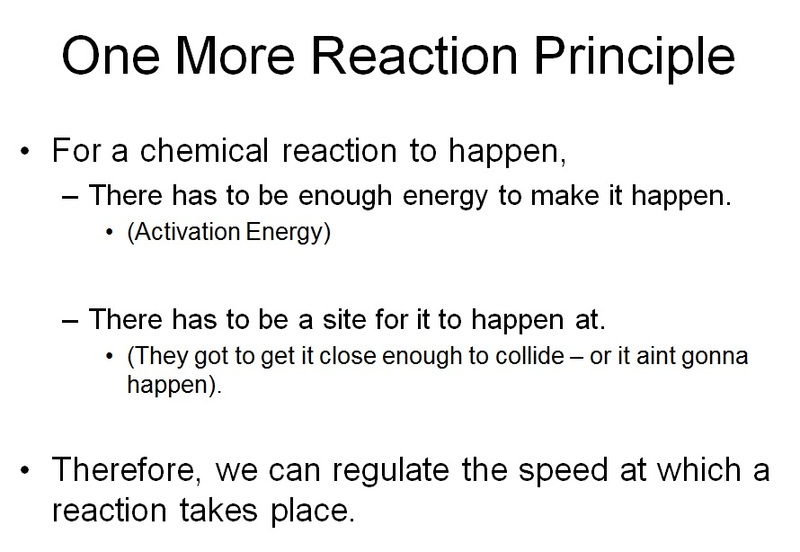 There are chemicals out there that provide sites for a reaction to take place. 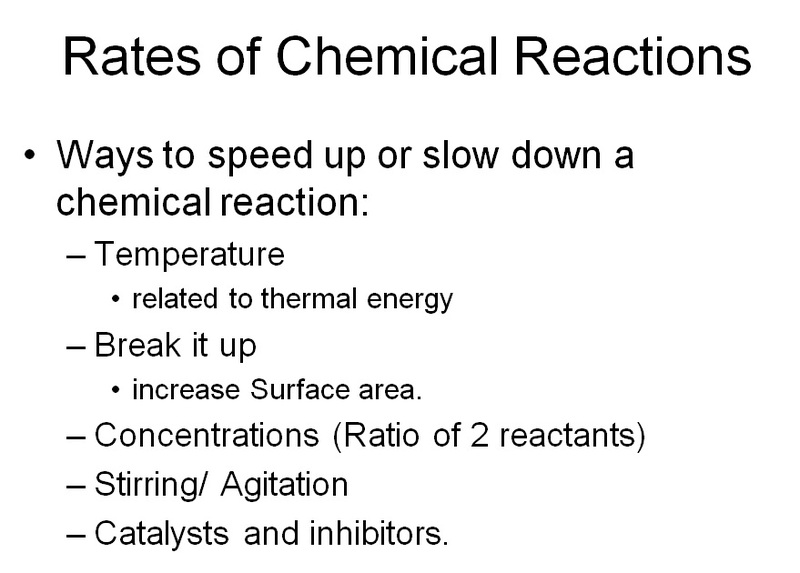 This lowers the level of activation energy so that a reaction takes place at a much lower temperature. i.e. the enzymes in your body. Inhibitors: These chemicals prevent the reaction from taking place. Preservatives in a loaf of bread inhibit reactions from taking place before the bread goes bad. We did a salt race to see who could dissolve their salt the fastest. 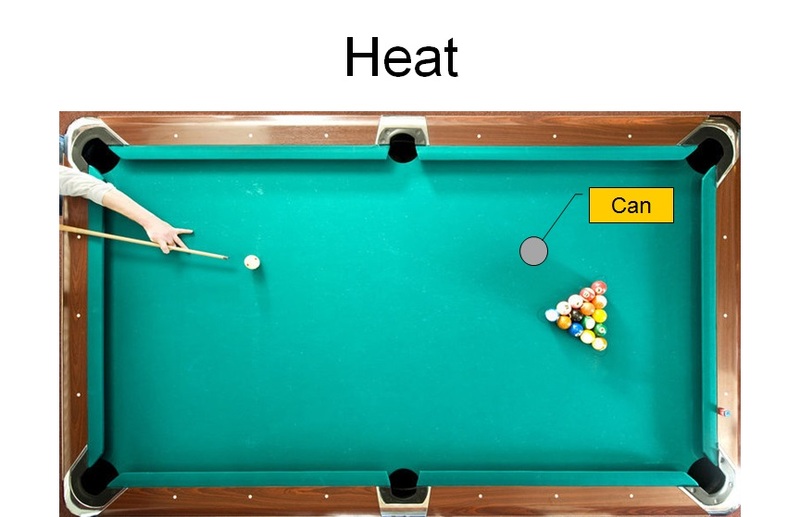 Increasing and decreasing heat during a reaction is a lot like trying to get a group of billiard balls to collide with a can on a pool table. 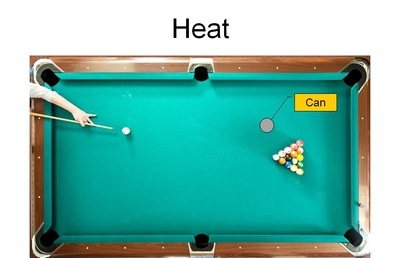 The harder you hit the Q-ball, the faster the other balls will move when hit – which will collide with the can more often. 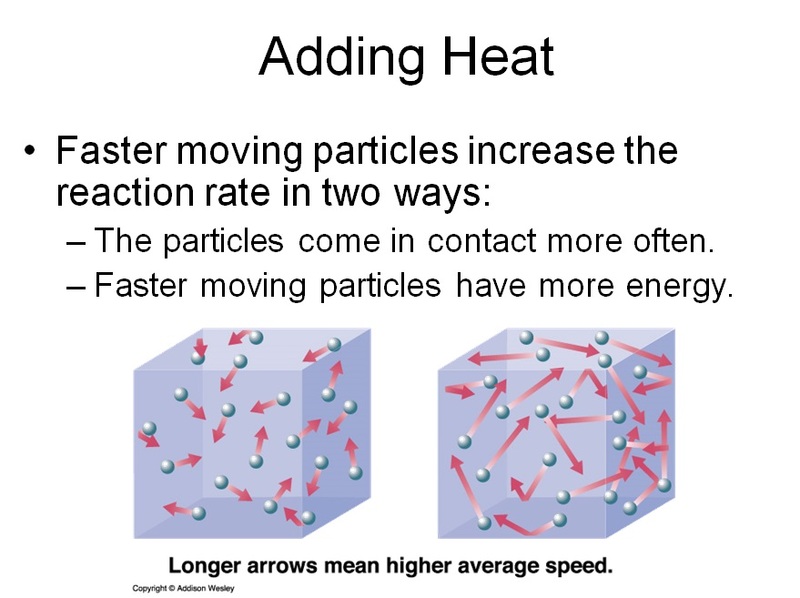 When the molecules are cold, it’s like hitting the Q-ball soft, which doesn’t get the other balls moving fast at all – which means they don’t collide with the can very often at all, and with very little force. Imagine that you are in line to get your lunch, and the student in front of you got his lunch and then stands there. You'd get a little frustrated wouldn't you? 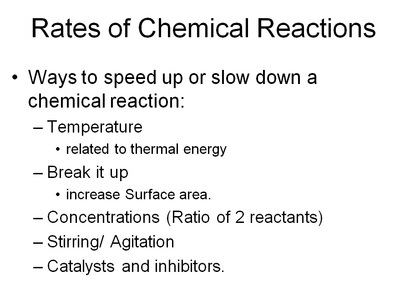 Imagine have a chemical reaction happen at the surface of one of the reactants, but the product just stays there. It would prevent another chemical reaction from taking place. Stirring helps to remove any old products so that new reactions can take place. It's like shooing the student in front of you so that you can get your lunch. 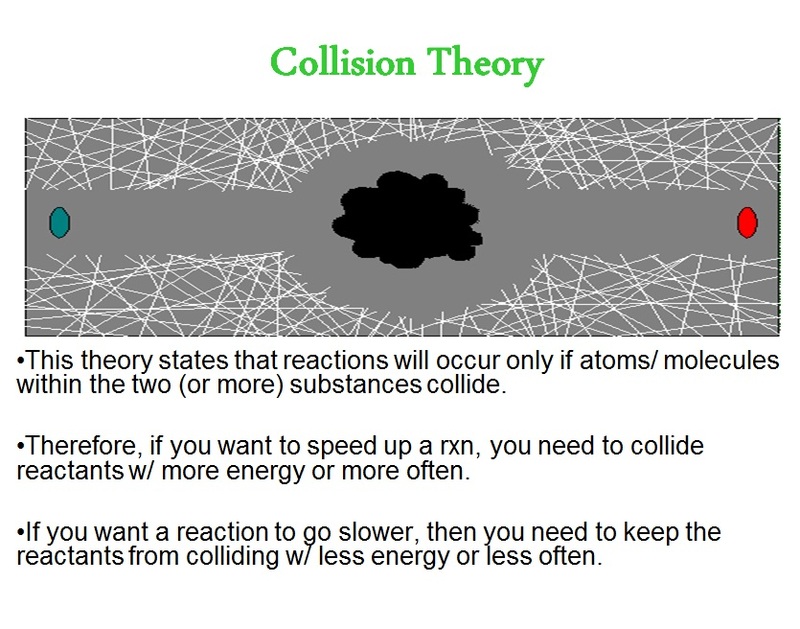 Chemical reactions happen at the surface. 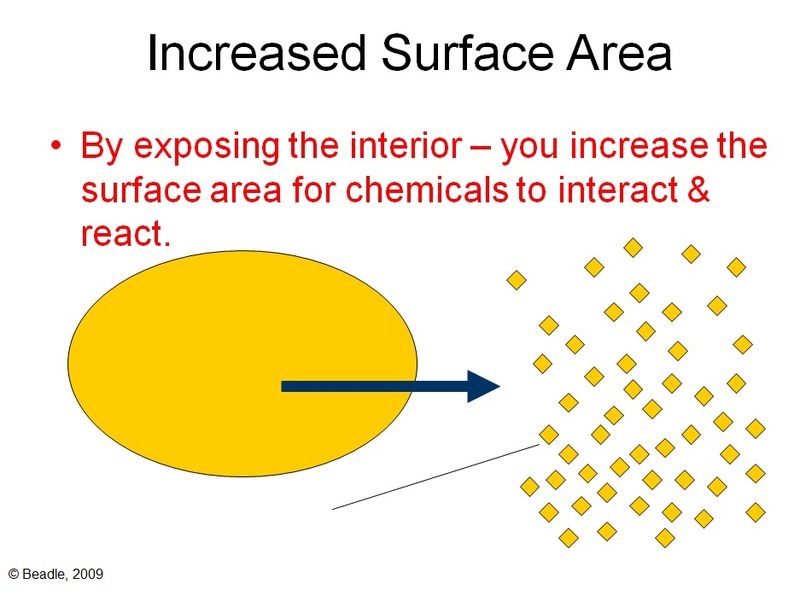 When you crush up one of the reactants, you are also exposing the inside of the same reactant. 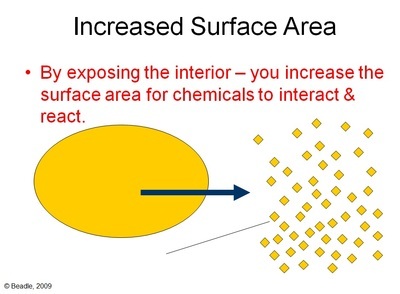 By exposing the interior of the reactant, it provides more sites for a chemical reaction to take place. Imagine you had a beaker full of vinegar and a beaker that had some vinegar but was diluted with a lot of water. Which beaker would react the most? Which one would react the least? Why? In order for a reaction to take place, the baking soda has to find the vinegar. The more often it can find the vinegar, the more often it will react - which makes it react more vigorously. If the baking soda has to swim around the water to find the vinegar - the less often it will react, which means that the water will react less vigorously. A catalyst is a type of material that provides a site for a chemical reaction to take place. 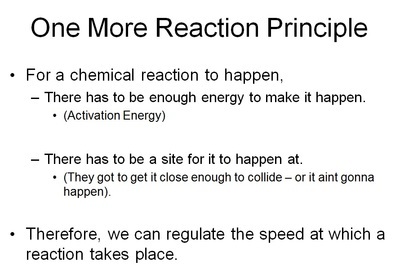 Simultaneously, it reduces the amount of activation energy needed to get the reaction to take place. Enzymes in our body are a perfect examples. 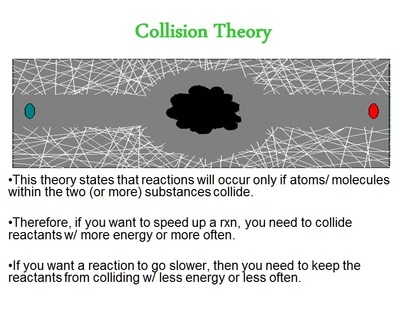 Enzymes can help to break down material, and even extract out the energy. You will learn more about enzymes in your upcoming Biology classes in High School. Inhibitors slow down chemical reactions by interference. Some examples might be a corrosion inhibitor and food preservatives.